Do you enjoy luxury? If you do, you'll love our bling custom wallpaper design. This wall mural works quite well in a room like the one pictured; crisp, clean whites and lines that ooze the finer things in life. Crystal chandeliers and the like can feel old and stodgy. Take the emphasis from the chandelier and transfer it to your walls with this wall mural. Orbs of cut diamonds give this wallpaper a high-end yet young, modern look. You may be old money, but this custom wall mural feels anything but dated. 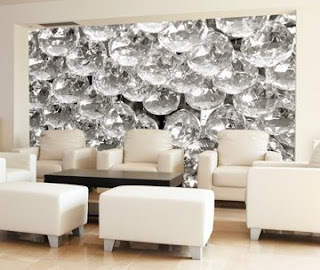 Not into diamonds but still want that bling look for a wall mural? Consider a gold custom wall mural, or sleek platinum will achieve the same effect without too much opulence. Maybe you have a completely different take on how you interpret bling, contact us with your vision of a blinged out wall mural and we'll make it happen on a budget that won't break the bank.